Frodo must inspire you a lot. Such skills! Thanks for sharing. I agree with other people that your commentary is quite interesting as well. Just beautiful! Re: Frodo must inspire you a lot. Thank you so much, Abandonada. It is gracious of you to comment. You really are getting extremely good at this lark, aren't you ?!! I love Caravaggio's paintings, especially his talent for painting light and shadow, ...the fruit, as you point out, are more than just edible, they are positively luscious !! As for his young men, well, have you seen the film of his life by Derek Jarman ?...it's an eye opener !! There's a film? There's a film? I was just commenting that it seems to me that his life would make a GREAT film. I will have to see if it's available to rent or borrow somewhere. :D That works beautifully! That's Frodo in the Undying Lands. I bet there's some elf lord or lady around who's kind of a leading figure in Bohemian elfish circles and he's got a room full of people in robes playing and reading poetry, and Frodo is just geeking out. Prettily. Angstily. Because that is what the Frodo does. Prettily. Angstily. Because that is what the Frodo does. Oh my, what a beauty!! 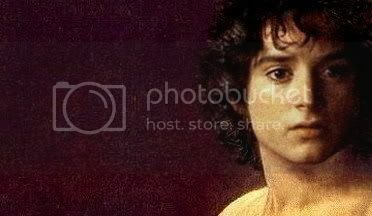 I should be accostumed by the way Frodo fits classical portraits by now, but I can't help, each time I'm totally amazed. I almost gasped when I saw this one and now I'm staring at its perfection. There should be a real exhibition of your Frodo's art, that would be fantastic. An exhibition? That would be rich, Melyanna. Just think of the extra guards they'd have to hire to keep the viewers fingers, lips and other body parts off the "canvases"! And a fresh contingent to force them all to leave at closing time. It’s been an age since your last 'Frodo Art Travesty' and it has definitely been worth the wait. Looking at ~ detail from Frodo in Caravaggio’s “The Lute Player” brings into focus that beautiful neck – yum yum slurrrrp! I love his long clever fingers. "Mechling" - I really do like that, Este. You are right. It was in August. But I was on a roll with the screencap series, and, besides, I just hadn't found new paintings that would truly suit. I have another Baroque painting "on the easel" - and have done for months - but I fear it will not be worth the work, turning out to be merely pretty (not that that's a bad thing!). But, just because you were my "tip", I'll let you know that I finally have chosen four screencaps I made from the love scene in Orlando. I think they might work, bad as the lighting is. Don't know when they'll be ready, but if they come out, I think they'll work well. Brava, Mechtild!! What a won-der-ful new art manip! No wonder it’s such a luscious feast for the eyes, being composed in a most sensuous way from the two top-notch ingredients Caravaggio and Film-Frodo. :-) Thank you so much for this. Your comments on Caravaggio’s life were also super interesting. He must really have led a most passionate, dramatic, wild life. Shame that he died at only 38. What fantastic art had he created if he had had more time! and I find it bears a striking resemblance to the late British actor Oliver Reed (played one of the Musketeers, for example), who was also said to have been a wild man (regarding drinking and fighting; he wasn’t involved in any capital crime though). It's unbelievable that an outstanding artist like Caravaggio was forgotten for 400 years! What an interesting sketch of Caravaggio, Whiteling! Yes, he does look rather like a young Oliver Reed - and "said to be to be a wild man" was most definitely "WAS a wild man" with regard to boozing. He appeared on TV extremely drunk on more than one occasion. A late, great actor though. So good to have another Mech-Manip - and it is as sensational as ever! Mechtild, you have become a master of art manip, and the info on Caravaggio was the icing on the cake. Goldenberry, it did come out rather swoonily, no? He'll have to wear that around BEWTE, although I don't suppose he'll be allowed to keep it on for long. Mmmmmm... Mechtild's/Caravaggio's lute-playing Frodo can sing to me of love anytime. In fact, I do believe that arrested look on his face means he's noticed me entering the room. His beauty is simply classic, is it - is *he* - not? I loved him as Athos in The Three Musketeers. Me, too, White Gull. I loved him in a lot of things, actually. But in The Three Musketeers, it was D'Artagnan (Michael York) on whom I developed a crush. Thankyou, Anwise Gamgee. He really does well in many previous periods of art, but I do think the films brought out the "baroque" in him in his scenes. If scenes like Rivendell were late nineteenth century, the fireside scene, the Prancing Pony and most of Frodo's Mordor scenes were definitely late Renaissance and Baroque. I am so thankful PJ hired the art directors they did. Together with the other designers they created a film filled with icons from art history. I think they helped give it that "epic", "great" feeling, as did Howard Shore's music. Greetings! Thanks for dropping by, Frodosweetstuff. Thanks, Chickelegs, for commenting, or I would never have noticed this. After some complainant got some of my Art Travesties taken down from Photobucket, I had to re-do everything, moving some of it over to another album at Scrapbook. I hadn't realised I didn't re-do this link. Yes, the Bacchus is beautiful. I did do a manip of Bacchus, linked above, but one day I would like to re-do it. I made it with what turns out to be a poor-quality copy of the painting. Since then I've found a much better copy on-line. It cries out to be redone with the better painting. Good news is never too late in coming, Saber Orlando. :) Yes, the hands are very good in the "Lute Player."